Once upon a time there was a band called The Zephyrs. They were regulars of the Scottish East Coast rock and roll scene, a guarantee of wit and energy. Their name hinted – depending on whom you asked – a herbal high-proof liquor, a mysterious breeze, or a Zephyrus, the Greek God of the westerly wind. One night The Zephyrs showed up at Currie Youth Club, in the outskirts of Edinburgh, dressed classy and with half smoked cigarettes. The “Queen” of the Currie Gala was being crowned and they were the chosen ones to liven up the party. By the end of the night, once the guitars were packed and the sash of the beautiful winner was folded, when one could only see puddles of beer and a loose tie in the dancefloor, the queen and the charismatic singer of The Zephyrs agreed to meet again (probably after enchanting her with the story of the Greek God). They lived happily ever after. The band that their sons Stuart and David Nicol founded 25 years later was also called The Zephyrs. The Zephyrs’ first album, “It’s OK Not To Say Anything” (1999), was released by a tiny label from Edinburgh and limited to 700 copies. In 2000, their friends of the notorious instrumental band Mogwai signed them up to their Rock Action roster of bands from Glasgow. It took Southpaw in 2001 to issue their LP, “When the Sky Comes Down It Comes Down On Your Head”, an appropriately fateful title; not because of the songs, which revealed a majestic orchestral rock and recalled This Mortal Coil, Bedhead or Low, but because Southpaw declared bankruptcy one week after it was released. After that, Spanish label Acuarela released two albums (their third “A Year to the Day”licensed to Setanta, and the fourth “Bright Yellow Flowers on a Dark Double Bed”, exclusive and available worldwide, in 2003 and 2005 respectively), they played festivals such as Primavera Sound and FIB, toured Spain and Portugal, and found a unique sound: a blend of their influences (intimate pop and country, noise-pop) which resulted in a perfect mix of Simon & Garfunkel and Mogwai, of Mojave3 and Auburn Lull. Those albums were recorded by a band in constant change. 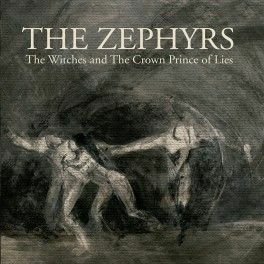 The Zephyrs were a group with a membership always in transition, every record released on a different label: EVOL, Southpaw/Rock Action, Setanta and Acuarela… In fact, their last release to date, “Fool of Regrets” (2010), started off as a solo project and ended up accidentally reuniting The Zephyrs. It was released by Club AC30, a retro-shoegaze label from London connected to Rachel Goswell (Slowdive) and ex- Adorable guitarist Robert Dillam, now drummer for The Zephyrs. “Fool of Regrets” was also a reunion with produced Michael Brennan and includes a number of collaborations, including Barry Burns from Mogwai and Gruff Rhys from Super Furry Animals. As a result of the record they were offered a number of select concerts and recorded sessions for Mark Riley (BBC Radio 6 Music) and Vic Galloway (BBC Radio Scotland)… And after that… they stopped their career for another lustrum. And now, after a silent eight year period, The Zephyrs have started recording a brand new LP in a self-conscious approach of being a chaotic collaboration of musicians around Stuart Nicol’s songs. They return to Acuarela to offer a foretaste with double A-side single “The Witches” and “The Crown Prince of Lies”. There is much of their spontaneous elegance (of clouds anticipating a storm) in their renewed pop that wades across Chris Bell and Gram Parsons, Slowdive and even Grandaddy, as if they were trying to shorten the path to the California sky passing through Scotland. The two songs flow thanks to a dim slow-motion psychedelia, sleepwalker pop glimmers, a sort of herding country music with a great melodic appeal. An unbeatable way of reinventing themselves and coming back to the scene.